Pluralsight is among the best places on the web to learn programming through videos. Whether you are a complete beginner or a pro looking to advance your coding skills to the next level, you’ll find a video course at Pluralsight that will meet your needs. Now here’s the interesting part. 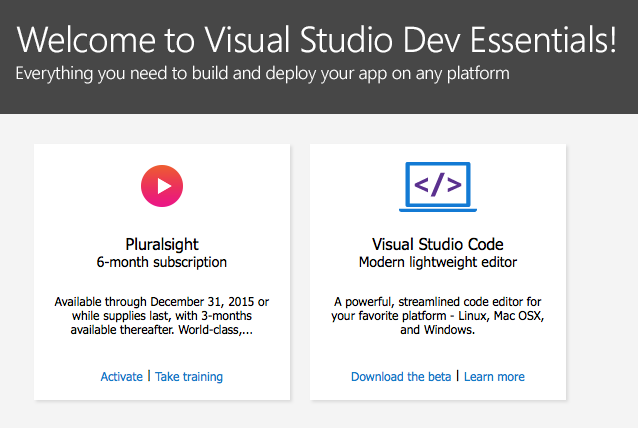 If you join the Microsoft Visual Studio program, which is also free, you automatically gain free membership to the entire PluralSight library for 6 months. No credit card or coupon codes required. Go to signup.live.com and create a new Microsoft Account. Skip this step if you already have one. Go to my.visualstudio.com and sign-in with your Microsoft account. This will open the Visual Studio Dev Essentials page. Here choose Pluralsight among the benefits (see screenshot) and click Get Code. You’ll taken to the Pluralsight website to activate and redeem your 6-month subscription. That’s it. Your subscription will be active for 6-months from the day you redeem the code. Pluralsight has iPhone and Android apps as well so you can learn on the go. And they have a desktop player that you can use to download videos and watch offline. On a related note, you should definitely give Visual Studio Code a try. This is light-weight code editor from Microsoft that covers most programming languages and is available for Windows, Mac and Linux. It feels snappy, supports themes & extensions and has most features you would look for in a code editor.